There is a place called Keansburg. Everything there is big. It's shiny. There are games and rides, bottomless boxes of sugar cereal and no bedtimes. Blue skies as far as the eye can see. In Keansburg, cousins and grandmas spoil you with cold-cuts and fresh fruit in coolers with umbrellas and pool floaties. It has a history, and people remember you from another time. In Keansburg, they tell you that you look like your mother. And they sound funny when they say it. The sidewalk there has a bumpy texture, the boardwalk feels like wood. You can eat Italian ice with sprinkles, and the heat melts you. The Pier in Keansburg goes for miles and miles and miles. The stoop is good for sitting, but you have to keep the door shut to keep the air in. And if it's July 4th, you can bang pots and pans as loud as you want. When you are in Keansburg, your birthday always happens. You get to have a cake and your grandma sings. You get to grow up...every time. I wish there was a way to go back to Keansburg. 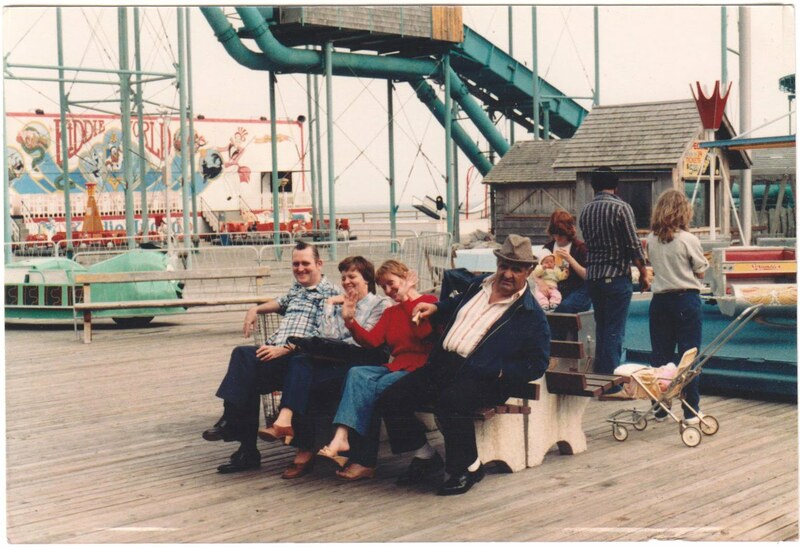 *Above Photo: Uncle Jim, Aunt Joan, Grandma Dot and Big Fred. Keansburg Boardwalk, New Jersey.